The Expedition® Circular is a non-treated mosquito net. The Expedition™ lineup of non-treated mosquito nets exceeds the standards of the World Health Organization’s 156 mesh standard with an extra fine 196 square mesh that allows for very good air circulation. It also has a stronger denier with a full 50 versus the more common 40. The Expedition™ Circular uses a folding PVC covered steel hoop that folds compactly for travel. Circular or bell style mosquito nets will expand or contract to fit any sleeping accommodation required, from cot to king. 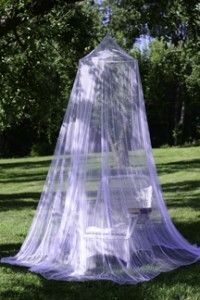 Place it over a favorite garden chair for an afternoon nap or the largest king size bed the circular mosquito net will easily accommodate them all. A flap style carry bag is included! The Expedition™ Single Rectangular is oversized by single standards with a full 39 inch wide and 84 inches long. It’s our non-treated mosquito net that’s designed to EXCEED the standards for insect and mosquito protection. The addition of a durable and properly sized carrying bag w/ drawstring closure makes these nets unique in this category. The duffle makes for easy carrying/packing and protects your net while not in use. With full measure dimensions the Expedition™ is more spacious too! As with all rectangular nets, the Expedition Single is versatile and can be hung by many methods. It can be hung from all corners to form a rectangle over sleeping area, or as a wedge by suspending from just the rings at the head area — excess material can be tucked under as preferred. The Expedition™ Double Rectangular style mosquito is a full 84 inches long and is designed to EXCEED the standards for insect and mosquito protection. The addition of a durable and properly sized carrying bag w/drawstring closure makes these nets unique in this category. The duffle makes for easy carrying and protects your net while not in use. As with all rectangular nets, the Expedition™ Double is versatile and can be hung by many methods. It can be hung from all corners to form a rectangle over sleeping area, or as a wedge by suspending from just the rings at the head area — excess material can be tucked under as preferred.